Hey there friends. One of my fondest memories of being in elementary school was when I felt that my teacher "gets me". I was a nerdy child, loved to read, kept to himself, and could say that I was a slightly distant from the other kids, but my teacher understood me. She knew exactly what to say, what to do, and how to get me to interact and to push myself to get the best grades possible and I will never forget that. I know now that if I was paired with a different teacher at that time, I may not have been as successful or I would have been in store for some very frustrating years. That one teacher made a huge difference in my life and I was very fortunate to be a part of her class. Now wouldn't you want your child to be paired with a teacher that "gets him/her"? Based on my experience, I definitely would. This is why I'm encouraging everyone check out Kidzmet. Kidzmet helps you create a pairing portrait that you would be able to provide to your school's principal. The pairing portrait will have your child's intelligence strengths, their personality, their cognitive style and their recommended teaching approach. This is one extremely helpful tool to help pair your child to a teacher that excels in your child's strengths and learning style. What parent would not want their child to be taught by a teacher that will "get it"? It's free, it's easy and if you're a parent, you should definitely check this out. This short questionnaire could revolutionize the way schools select students for teachers. 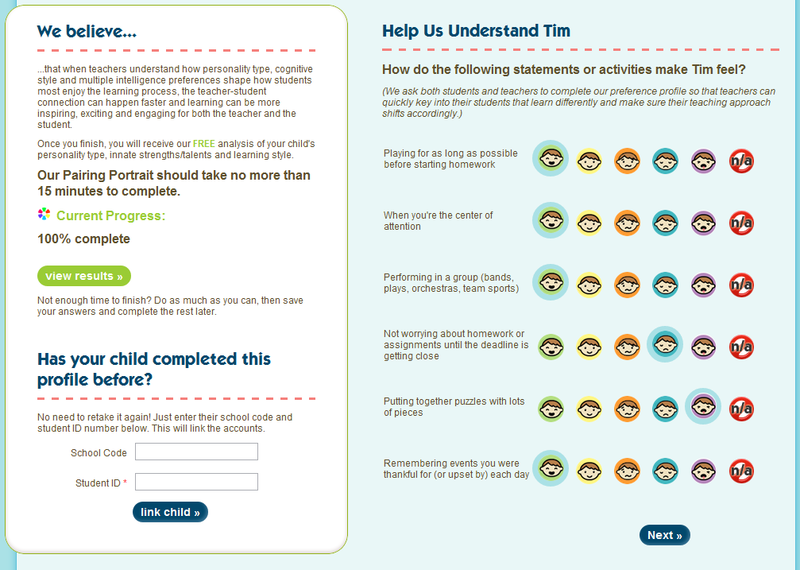 10 minutes is all you need to help ensure that your child will succeed. Check out a sample of the questionnaire here and a sample of the pairing portrait here. 10 minutes for your child now could save them hours of frustration later. Later!